Lately, I've been trying to check in with my pace. I'll note the pace of my day, my schedule, my speech, my movements, my breath, my energy, my attention span, etc. Over the last month or so, I'd say that I've spent my time pretty hyped up. I've been running around like a chicken with it's head cut off. But looking back, there wasn't anything really pressing that would have caused my head to pop off in the first place- it's not like I perform open heart surgery. What was causing my tight wind up was my inability to take rest in between the events. I've been craving more balance and need to put just as much importance on the time spent being "lazy", as the time spent "accomplishing". Every time the phone rings, it creates a small vibration in you. There is not true peace-there is a hint of worry: Who is it that's calling? Is this going to be good news or bad news? You cannot hold yourself back and you run immediately to the phone. In Plum Village, we remain where we are and we consider the sound of the telephone to be like the bell of mindfulness. "Breathing in- I am calming myself; breathing out- I am smiling." 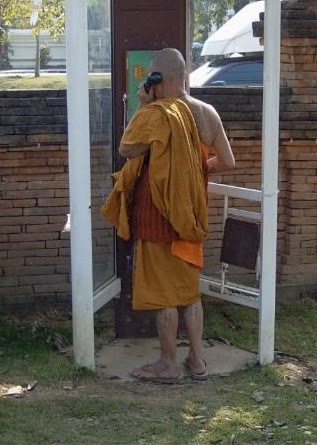 Then we go to the telephone in the style of walking meditation, but before that we practice mindful breathing. In our community, every time we hear a bell, we stop-we stop our thinking, we stop our conversation, we stop our work; and we begin breathing- an inbreath, then an outbreath- and it is the same thing whether it is the telephone ringing or the clock chiming. In this way we have lots of opportunities to return to ourselves, to our true home, here and now, to touch peace. And what we are stopping, in order to be able to be alive, is our thinking.